It all started during freedom summer in Mississippi. 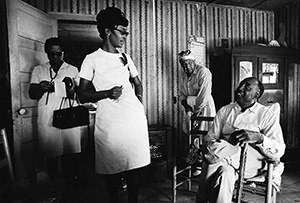 Dr. H. Jack Geiger was there, in those sweltering months of 1964, as the national program chairman for the Medical Committee for Human Rights, a group of doctors and nurses who supported and cared for the civil rights activists. The poverty he witnessed among African-Americans was staggering. In the cotton-producing Mississippi Delta, mechanization had all but put sharecroppers and day laborers out of work; in some areas, unemployment was over 60 percent. Families lived in dilapidated plantation shacks, most of them without piped water. Geiger, now 92 and blind but ever the activist, still vividly recalls this desperation. “There were people trying to shoot squirrels and gather pecan nuts—anything to feed their kids,” he said in a recent interview at his home in Brooklyn, New York. With these formative experiences etched in his mind, Geiger decided he had to do something. The next year, he proposed and received federal funding to establish the country’s first two community health centers—one in rural Mississippi, one in urban Boston—sponsored by Tufts University. Geiger and these centers sparked a national movement. Today, there are more than 1,400 health centers—operating more than 10,000 clinical sites—in all 50 states and all U.S. territories. Jack Geiger has been concerned with issues of social justice since he was a teenager. He graduated high school in 1941, just shy of 15, and fled his parents’ home one night to see Orson Welles’ production of Richard Wright’s Native Son on Broadway. Geiger was so enamored with Canada Lee’s performance that he talked his way backstage and struck up a friendship with the prominent black actor. For a time, he considered Lee’s Harlem penthouse a second home. There, Geiger met Wright, Billy Strayhorn, Adam Clayton Powell Jr., and other lions of the Harlem Renaissance. “I was probably the only shrimpy, nerdy kid from the Upper West Side to be mentored by Langston Hughes,” Geiger said. Transporting a patient to the center. He went on to study journalism at the University of Wisconsin, served for three years as an officer in the U.S. Merchant Marine—the only racially integrated military service at the time—and then studied premed at the University of Chicago. He was active in the civil rights movement all the while, helping to form an early chapter of the Congress of Racial Equality and protesting the University of Chicago medical school’s then-discriminatory admissions process. After a few years as the science and medicine editor at the International News Service, Geiger started medical school in 1954 at Western Reserve University, now Case Western. 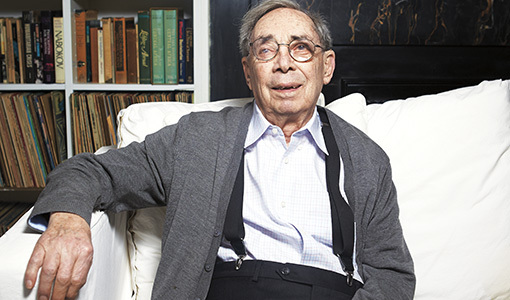 Geiger told Warren Weaver, vice president of the Rockefeller Foundation—whom he had met on a committee—about the pivotal moment on the hospital steps. Weaver sent Geiger information about a project in South Africa the foundation was funding: Health centers in Pholela and Durban, started by community-oriented primary care pioneers Sidney and Emily Kark. Intrigued, Geiger sought and received a scholarship from the Rockefeller Foundation to spend four-and-a-half months of his senior year working with the husband-and-wife physicians. “I think Tufts has never really had full and sufficient credit for how well it behaved in all of this—the kind of risks it took and the kind of investments it made were really striking for a medical school,” Geiger told me. Geiger and Gibson decided to pursue two health community centers: one at Boston’s Columbia Point housing project and one in Mississippi. Once Geiger scored a $1.2 million grant from the newly formed U.S. Office of Economic Opportunity—a hard-won battle that involved Geiger sitting-in at OEO director R. Sargent Shriver’s office—they started their work closer to Tufts, at Columbia Point. 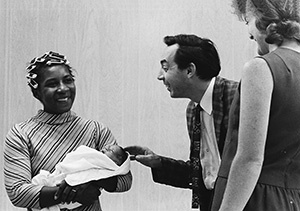 Before Columbia Point Health Center opened in December 1965, residents reported traveling two to five hours round trip to get medical care—only 28 percent of the 6,000 people living in the housing project had ever had a general medical check-up. In the center’s first year, residents saw a doctor an average of four times. And a study of 54 families continuously on public assistance showed the health center reduced hospitalization by 80 percent in two years. In 1966, U.S. Senator Edward Kennedy visited Columbia Point to see firsthand what Geiger and Gibson had accomplished. Shortly thereafter, he drafted an amendment to the Economic Opportunity Act asking for $100 million to start a national network of health centers. The legislation passed the same year, although the funds were reduced to $51 million. 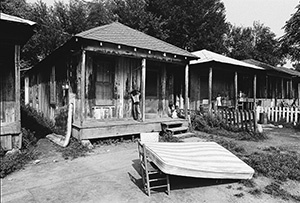 Starting the community health center in Mound Bayou, Mississippi proved more difficult. When Geiger and Gibson began scouting sites in late 1965, white politicians and civic leaders, as well as local doctors, balked at the plan. However, that was when the Tufts connection had an additional benefit: It turned out that, according to federal law, the governor could not veto an OEO project if was backed by an institution of higher learning. After conceding that point, the governor refused to bestow Tufts-Delta Health Center with a nonprofit corporation charter—so it opened in 1967 as a charitable trust, with six Tufts University trustees signing on to support the effort. 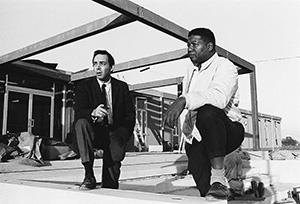 Geiger and John Hatch (right) surveying construction at the health center. By then, Geiger had joined the Tufts staff as a professor in the Department of Community Medicine. While Gibson stayed up north to oversee operations at Columbia Point, Geiger became director of the Tufts-Delta Health Center, recruiting some white doctors from the North to come to Mississippi with him and convincing black doctors and health professionals from the region to return and get involved. John Hatch, an African-American activist and former assistant director in the Boston Housing Authority who had done much of the original outreach and scouting in the Delta, stayed on as community organizer. Two African-American physicians—Aaron Shirley and Bob Smith—also joined the staff on a part-time basis, each commuting 130 miles from Jackson to Mound Bayou a few times a week. (Smith, a leader in the MCHR, put out the call during Freedom Summer to Northern physicians for help.) Sanitarian Andrew B. James, obstetrician Helen Barnes, and Sister Mary Stella Simpson, a Catholic nun and nurse-midwife, rounded out the team. From the moment they launched the center, Geiger and his colleagues tackled the social determinants of health from the ground up—literally. They dug wells for clean water and improved sanitation. Construction crews patched roofs and walls and built porches. After realizing pregnant women were suffering miscarriages after repeatedly jumping a few feet off their stoops to the ground, the workers constructed steps, too. A transportation system was set up to shuttle far-flung patrons in north Bolivar County to receive primary care in Mound Bayou, though nurses also traveled to patients. In the first two years, the center provided free medical care to 8,000 people, and made more than 10,000 home visits. And while the center was open to all patients, few whites came through the door. To further ensure community participation among the roughly 14,000 African-American residents of the 500-square-mile area served by the center, 10 health associations were formed to assess and address local needs. Each association elected representatives to the North Bolivar County Health Council, which had say over all initiatives and decisions made by the center. One of the main priorities was nutrition. Families in Bolivar County had a median income of less than $900 a year, or less than $3 per day per family—not nearly enough to put food on the table. 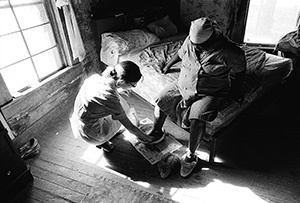 To address malnutrition, the center’s physicians wrote prescriptions for food for sick families and paid local African-American-owned grocery stores to fill them, using funds from the pharmacy budget. Later, the team received an OEO grant to finance this innovative approach, specifically to improve the diets of pregnant mothers, infants, and young children. Chatting with residents during a house call. The Tufts-Delta Health Center and its related projects dramatically improved health outcomes for Bolivar County residents. Better nutrition and access to care and clean water, employment opportunities, and housing upgrades—coupled with the advent of social programs such as food stamps, Medicaid, and Medicare—all led to decreases in incidences of fetal losses, infant mortality rates, infectious disease, and chronic illnesses. Living conditions in North Bolivar county. And empowerment went beyond the North Bolivar County Health Council and the farm co-op. “The ultimate goal was to establish pathways out of poverty and into a better life,” Geiger wrote in his foreword to Thomas J. Ward Jr.’s history of the project, Out in the Rural: A Mississippi Health Center and its War on Poverty. To that end, the center instituted an educational and college prep program, accredited by local junior colleges. Geiger also opened a pipeline between the Deep South and Tufts University School of Medicine. One of the first graduates, high school science teacher Willie B. Lucas, returned to work at the Tufts-Delta Health Center, eventually becoming the clinical director. 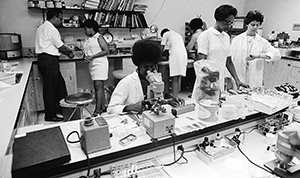 Through these efforts, the educational program produced seven doctors, five Ph.D.s in health-related disciplines, three environmental engineers, two psychologists, several registered nurses and social workers, and the first 10 registered black sanitarians in Mississippi history during its first decade. L.C. Dorsey, for one, was a sharecropper’s daughter who grew up on a plantation and dropped out of high school to engage in civil rights activism and raise her kids. She enrolled in the GED program at the Tufts-Delta Health Center then became the deputy director of the farm co-op before leaving to get a master’s in social work at the State University of New York-Stony Brook and later, a doctorate in social work from Howard University. (She went on to serve as executive director of the Delta Health Center from 1988 to 1995, long after it parted ways with Tufts.) Each of her six children has a college degree—one of her grandchildren, Aisha Nyandoro, earned a Ph.D. in community psychology from Michigan State University and is cofounder and CEO of Springboard to Opportunities, a nonprofit that gives voice to residents of affordable housing in Mississippi. All incoming medical students at Tufts watch a 45-minute video of Geiger telling the story of the community health centers, filmed at the School of Medicine in April 2008. “It brings me to tears every time,” Schlaff said, adding that it ends with Geiger talking about children of center patients and staff who are now health-care leaders around the globe. As for Geiger, he left the chair of the Department of Community Medicine at Tufts in 1971 to helm the Department of Community Health and Social Medicine at SUNY-Stony Brook, and then went on to chair the same department at the City University of New York Medical School. He was a founding member of the Committee for Health in South Africa, Physicians for Human Rights, and Physicians for Social Responsibility—the latter two organizations both shared in the Nobel Peace Prize. Today, community health centers care for more than 27 million low-income Americans— about one in 13 citizens—regardless of whether they have insurance or the ability to pay. Offering a range of services, from eye exams and pap smears to mental health counseling and dental work, they treat both urban and rural vulnerable populations, including homeless people, agricultural workers, and public-housing residents. The centers reduce the need for emergency room, inpatient hospital, and specialty care, saving the national health care system an estimated $24 billion a year, according to research from George Washington University. To receive federal funding, the majority of a center’s governing board must be made up of its patients. A Tufts-Delta Health Center nurse makes a home visit. The movement celebrated its 50th anniversary in 2015, and both centers started by Geiger and Gibson are still in operation. Long separated from Tufts, Columbia Point Health Center was renamed the Geiger Gibson Health Center in 1995 and is now part of Harbor Health Services. The North Bolivar County Health Council voted to follow Geiger to SUNY-Stony Brook in the early 1970s, cutting ties with Tufts, and then to merge with the Mound Bayou Community Hospital. (Funded by an OEO grant, the hospital arose from a merger of two area fraternal hospitals and relied on surgical residents provided by Nashville’s traditionally black Meharry Medical College.) The hospital closed in 1983, however, and the Delta Health Center floundered until Dorsey took over as executive director in 1988, restoring it to financial health. Delta Health Center still serves the poorest of the poor in the Mississippi Delta at 10 facilities in five counties, said CEO John Fairman. While the North Bolivar County Farm Co-op became the Alcorn State University Demonstration Farm years ago, the Mound Bayou center is again farming eight acres, growing okra, hull peas, cantaloupe, and other fruit through an arrangement with Delta Fresh Foods forged in 2012—patients can pick the produce. The center has been operated by a nonprofit community board for decades, and it’s now reinstating the health associations from Geiger’s time to engage citizens and solicit feedback. In 2014, the Delta Health Center opened a new state-of-the-art facility in Mound Bayou, funded by a $5 million grant from the U.S. Department of Health and Human Services. The light-filled, 26,000-square-foot building houses a pharmacy, social services, a certified diabetic clinic, and more. Its name? The Dr. H. Jack Geiger Medical Center. Although a “wonderful cadre of folks” was involved in starting and running the Tufts-Delta Health Center, such as Hatch, Gibson, Shirley, Smith, and others, Fairman said, “We wanted Geiger to stand alone because he was, to me, probably the most consequential figure to emerge in a whole field of all-stars.” Geiger’s portrait hangs in the entryway.